I have a lot of bird feeders. Each new season brings changes to the bird dynamics in the yard so I tend to do some tweaking of feeders or their placement each season. During warmer months, birds have a wider variety of natural foods available so, while they still eat birdseed, they don’t go through as much of it. Now that fall has arrived, birdseed consumption will soon be picking up. I want to see if I can reduce the amount of seed winding up in squirrel bellies this winter, so I made another change in my set-up. This time, it involves turning a ground platform feeder into a platform feeder on top of a pole. 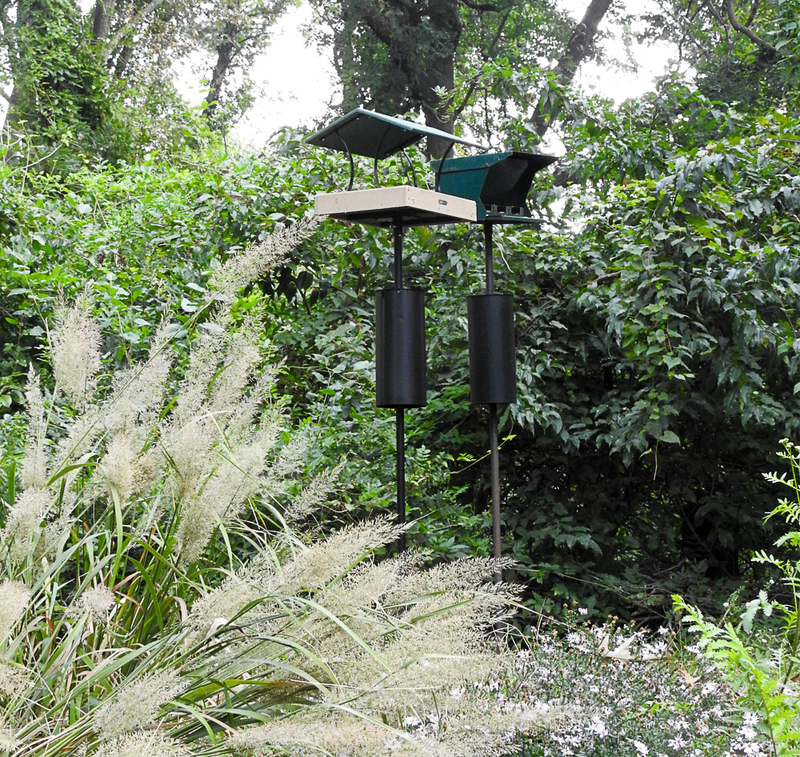 I purchased this covered Birds Choice platform feeder last year at my local bird store, Mother Nature’s in Columbia Maryland. It can be found on Amazon as well. The tray is approximately 13″ x 16″ with the roof adding a few more inches as it overhangs just a bit. It has a sturdy construction of mostly recycled polymer. The removable metal seed tray is perforated to let water drain through. When I bought this, I already had two Backyard Boys uncovered ground platform feeders but they get wet when it rains or snows unless they are placed in protected positions and when seed gets wet, it can rot. My thought in buying this covered feeder was that it would be a little more protected from wet weather and, with legs on it, it sits higher so is less apt to get buried in bigger snows. This particular feeder is designed to be flexible. It can be used on the ground, on a pole or hung from a sturdy tree branch or other support. 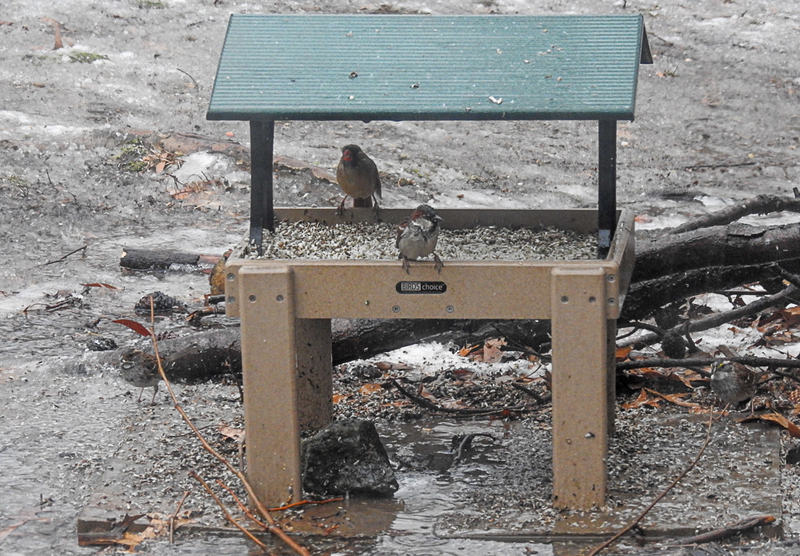 The feeder consists of a roofed platform. You purchase additional accessories or hardware for the way you want to use it. I wanted a ground feeder, so I purchased a set of legs when I bought the feeder. My local store offered sets of legs made of either wood or of the same recycled polymer as the feeder itself. I picked the later as, although more expensive, they should last longer outside. The legs came with screws, but the feeder itself didn’t have pre-drilled holes for them, so Jim kindly drilled holes and put the legs on for me. 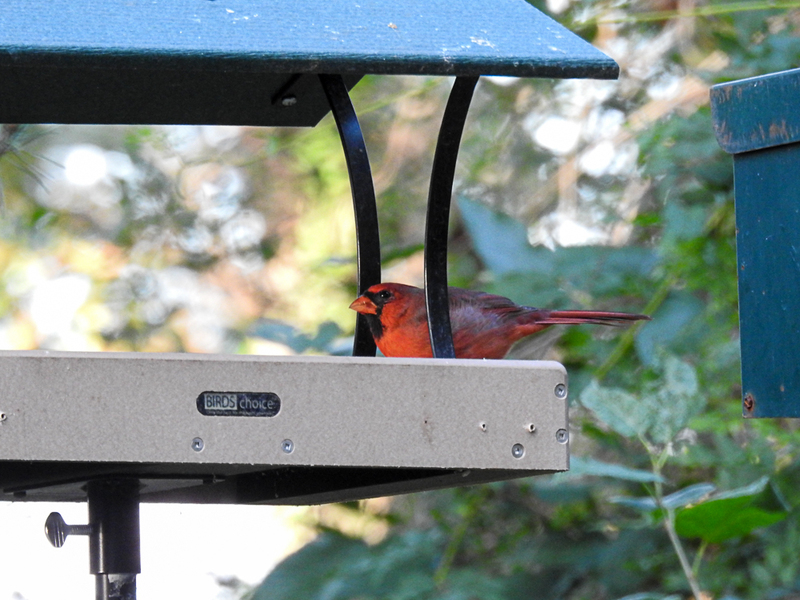 I used this feeder with the legs on throughout the fall and winter months. I must admit that it was not hugely popular at first. Often it takes birds awhile to try out a new feeder but even over time, this one was typically the last to get bird attention if other feeders were full. I’m really not quite sure why; maybe something to do with the placement. Once we started getting snow though, it became more popular, as the high legs and roof kept it clear of the snow and the seed dry. But, as happens with ground feeders, it also became popular with squirrels. I fill ground feeders with safflower seed, but although my local squirrels weren’t thrilled with it at first, they will eat just about anything if they are hungry enough and I think they’ve developed a taste for it. So the feeder would tend to be dominated by squirrels and a good portion of the seed went into their furry bellies instead of the birds. 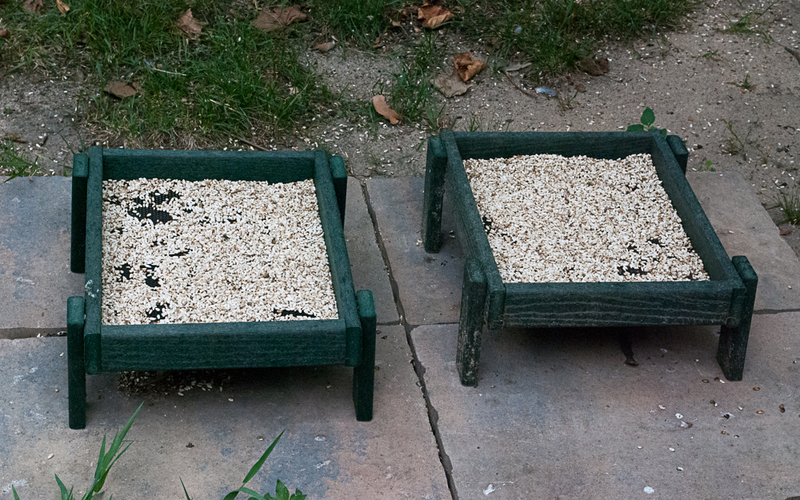 When summer began and birds were eating less purchased seed, I decided to stop filling the three ground feeders. I instead used one Backyard Boys open ground feeder for mealworms, peanuts and other occasional treats, and the other (still under a picnic table) for occasional seed emptied out of one of the hanging platform feeders. I took the covered feeder up and stored it in the garage for the season. Now that fall has arrived, I have taken the covered feeder out again but decided to mount it on a pole so that it is no longer a ground feeder. I went back to my local store, where I got recommendations for the hardware I needed. If you have read my previous posts on poles for bird feeders, you may notice that this pole is not the shepherd’s hook type used as a base for my hanging feeders. While you can purchase chains to hang this feeder, I instead mounted it on top of a straight pole, which makes more sense for a feeder this heavy (approximately eleven pounds empty). I purchased a sturdy straight pole, a metal anchor piece that goes into the ground that the pole slips onto and a metal mounting flange that attaches to the bottom center board of the feeder and allows it slide over the top of the pole. (There is a screw on this piece that you can hand turn to firmly secure it to the pole.) 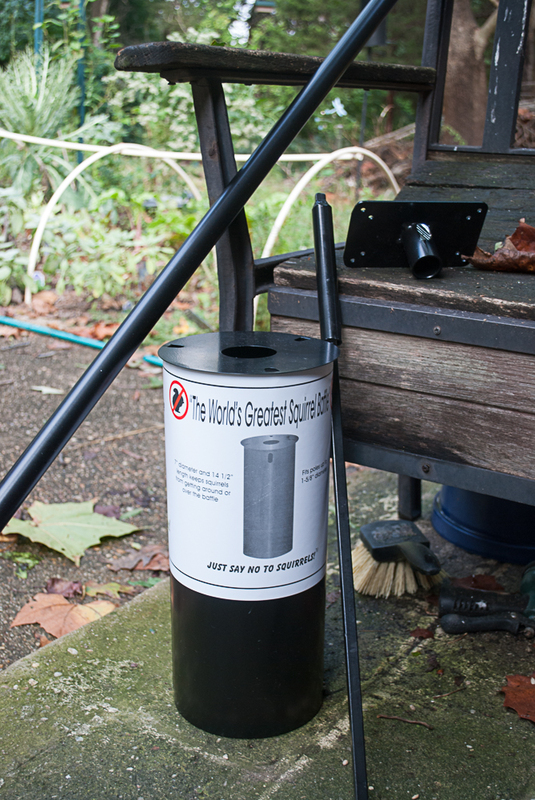 I also purchased another cylindrical can baffle to protect the feeder from squirrels. I’ve learned the hard way that the trick to keeping squirrels out of feeders is to purchase the right feeders, baffle them correctly and place them strategically. Placement is probably the thing that trips people up the most about feeders. First, to cut down on window collisions, feeders should either be within three feet of a window or more than thirty feet out. If you have squirrels in your yard, as I do, it is important to keep feeders out of squirrel jumping and climbing range. 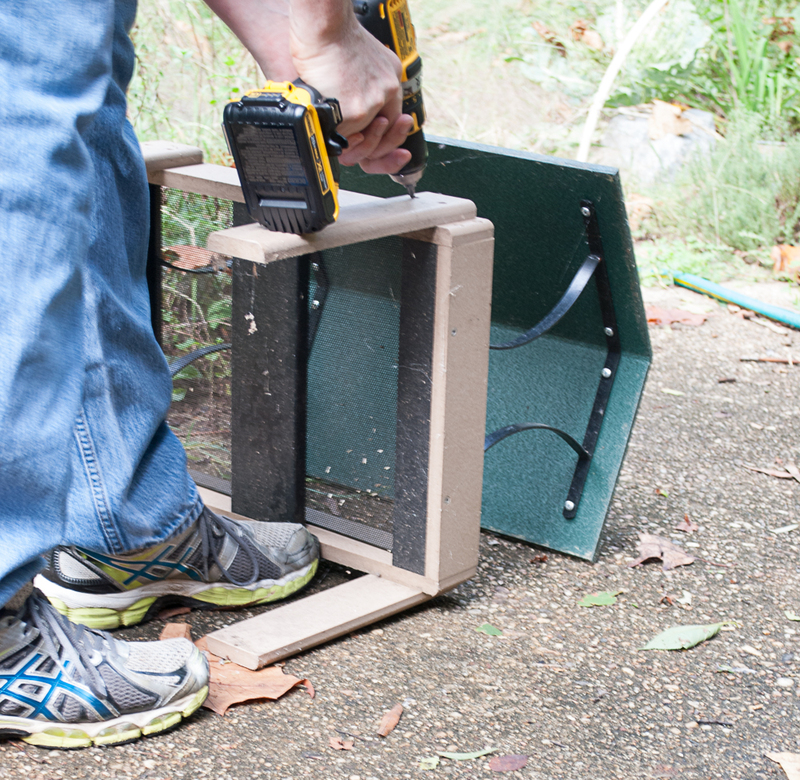 A can baffle needs to be attached to the pole beneath the feeder so the squirrels can’t simply shimmy up it. 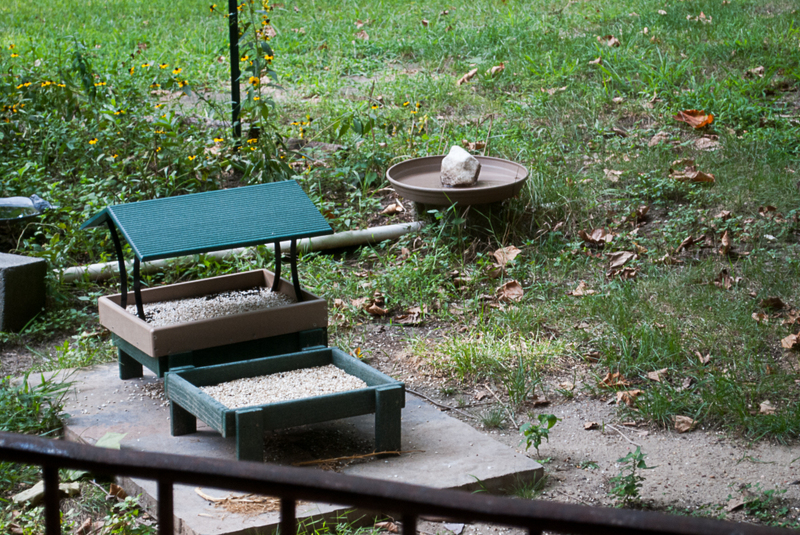 The pole and feeder should be placed at least eight feet from anything that a squirrel can leap from. 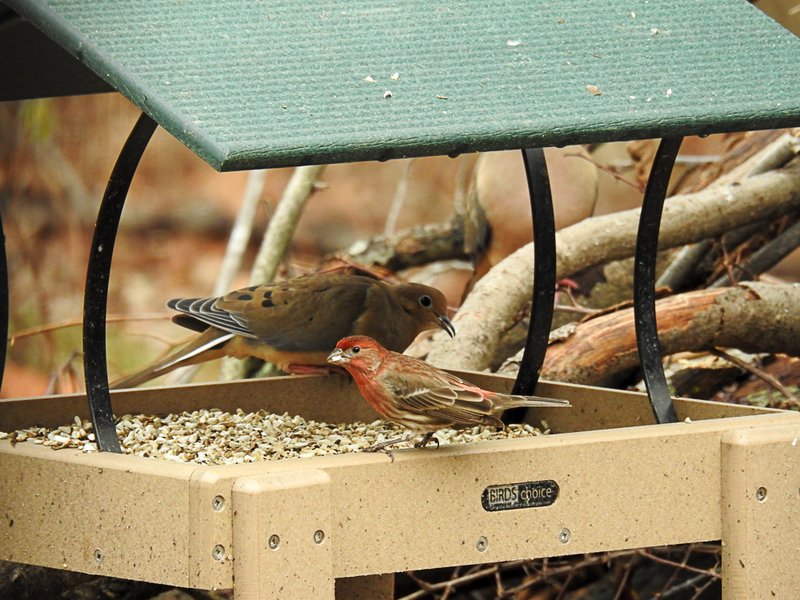 I also like to position feeders so that birds using them have a decent chance to get to cover when the local Coopers’ Hawk suddenly swoops into the yard to hunt in the feeder area. 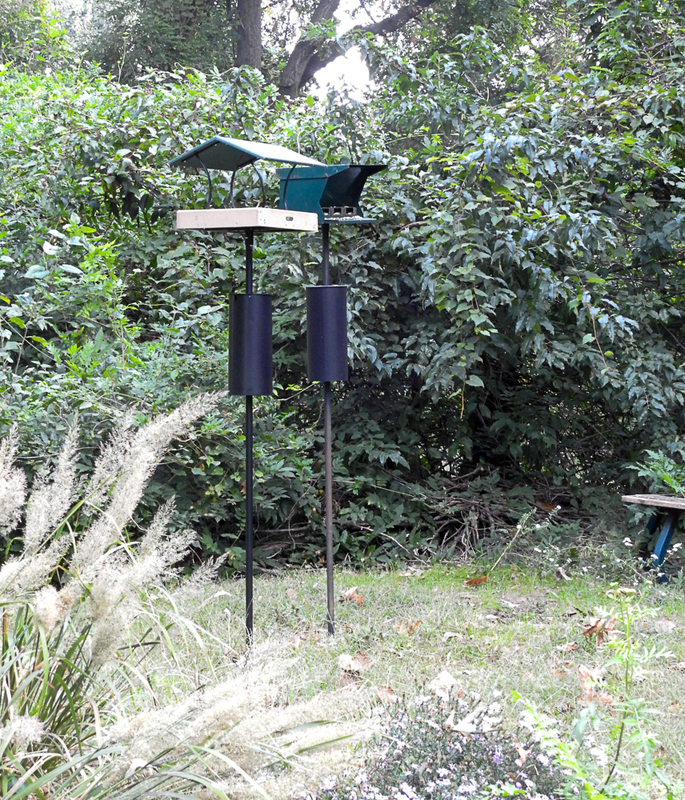 I put this one right next to an old hopper type feeder on a pole that is close to a tangle of wisteria the birds like for cover. This “new” feeder is now quite popular with Northern Cardinals, Mourning Doves, House Finches, Carolina Chickadees, Tufted Titmice and White-Breasted Nuthatches. I suspect that some of my less favorite birds, like Red-Winged Blackbirds, Common Grackles and Brown-Headed Cowbirds will enjoy this feeder as well, particularly if there is sunflower it it, but they tend to hang out in my yard more in the winter and early spring so I’ll have to see how that goes. I’m not sure how the winter ground birds like White-Throated Sparrows and Dark-Eyed Juncos will react to raised platform feeders rather than ground platform feeders. I’ll have to watch that as well. 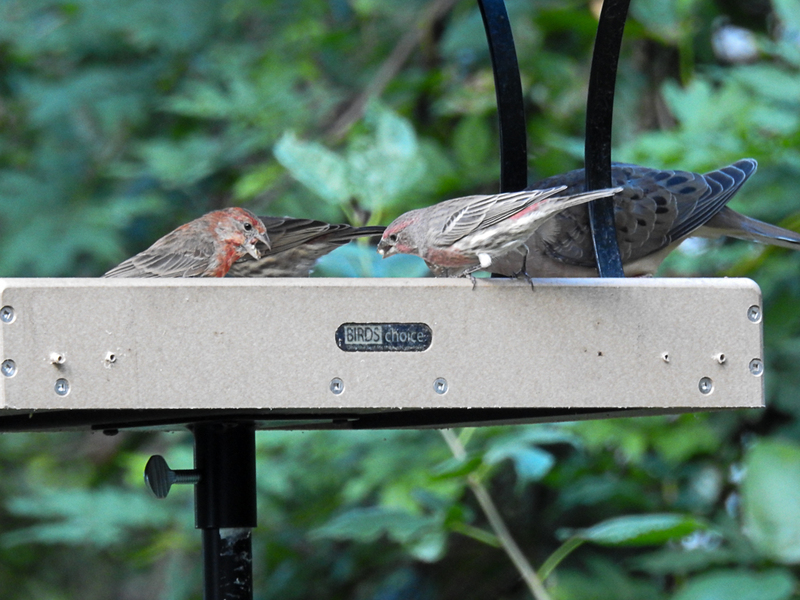 But right now my feeders are working well. As time passes, if I find that this changes, I’ll tweak things again. I’m hoping though that with this new arrangement, I’ll be able to conserve more seed and I won’t be spending quite as much on seed this winter! Great info!! I always love & learn so much from your blog 🙂 thanks so much!